(JNS) In the summer of 1993, I found myself at one of the most unsettling dinner engagements that I have yet experienced. I was a young journalist writing about the war in Bosnia, and a friend of mine in London who was working as an aide to Haris Silajdzic, the Bosnian foreign minister at the time, called one day with an invitation to sneak into a private dinner Silajdzic was attending in the British capital that same evening. I don’t remember the precise words of Silajdzic’s response, but I do remember being profoundly moved by what he said. Bosnia was the home of a “precious Jewish community that has been with us for 500 years,” he reminded the Iranian regime’s envoy. He then added that he was not prepared to alienate Bosnia’s Jews by pronouncing on the Israeli-Palestinian conflict; in any case, it was hardly the most pressing matter facing his ravaged country. I recalled that particular evening after reading the script of “Looking for Europe,” the one-man play performed in New York earlier this week by the well-known French-Jewish public intellectual, Bernard-Henri Lévy. While the play is a sharply written reflection on the current state of politics in both America and Europe, the Bosnian war of two decades ago, which was a seminal experience for Europe as a whole, still looms large. 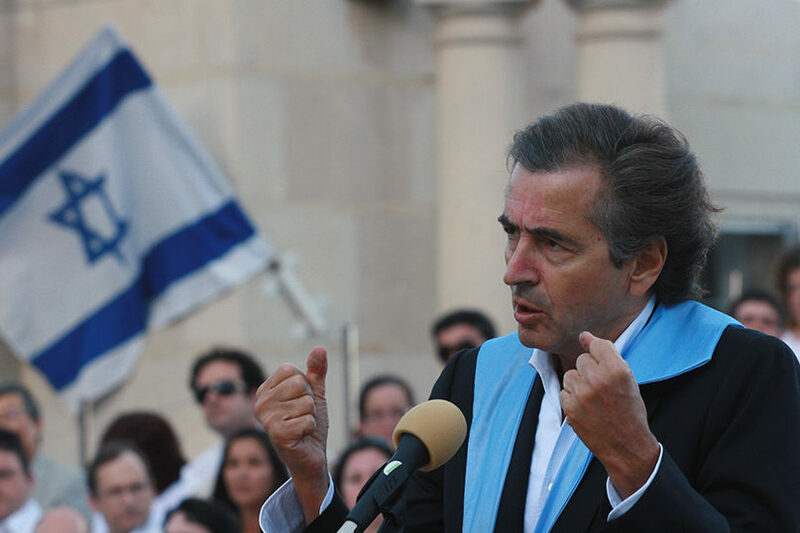 Much as he is doing with the Kurds now, back in the 1990s Lévy was an outspoken advocate of decisive action to stop the genocide in Bosnia, becoming a regular thorn in the side of a Franco-British-Russian alliance that effectively shored up the gains of the Serbian separatist militias. Lévy is also known for his writings on Judaism’s intellectual achievements down the ages, as well as his stalwart opposition to antisemitism and his deep love of Israel (if not its current government). So Judaism and the challenges faced by Jews globally also loom large in his play. At various points in the play, Lévy speaks about the symbiosis between Bosnia – a resolutely multicultural society with a largely secular Muslim majority – and its Jewish community, who fled the Inquisition in Spain for a country that at the time was a province of the Ottoman Empire (my maternal grandfather, incidentally, was born in Travnik, a city that served as the Ottoman regional capital for two centuries). For anyone who was in besieged Sarajevo during the war, Lévy’s emotional plea to heed “the bells … the voices … the prayers” of that great city, accompanied by the sounds of Christian, Jewish and Muslim supplications, is extraordinarily haunting. Although that observation can be critically scrutinized – as my surviving relatives told me, Bosnian Jews feared the local “Ustase” and “Handzar” collaborators sometimes more than the Germans during the war, while the present-day community is tiny – Lévy is absolutely correct that hostility to Jews continues to plague the larger nations on both sides of the Atlantic. It is at this juncture that Lévy attacks U.S. President Donald Trump in terms that will outrage his supporters. “Baby Trump,” as Lévy calls him, has “set loose” the demons of far-right antisemitism in America, and with it the devastating massacre of 11 Jews at prayer in Pittsburgh’s Tree of Life*Or L’Simcha Synagogue on Oct. 27. The French philosopher is not the first person to have expressed that view, but in this case, he does so as a warning to his fellow Jews not to be seduced by Trump or by other populist politicians – like the new Brazilian President, Jair Bolsonaro, a fervent supporter of Israel, but also a man who said that he would rather his own son die than come out as a gay man. Faith in our political skills, confidence and pride in our intellectual and spiritual heritage, and cognizance that not every place in the world can be a “Sarajevo” – this is Lévy’s message to Jews and by extension, non-Jews. At a time when many European intellectuals depict Israel as a reincarnation of Nazi Germany and dismiss accusations antisemitism as a political smear whose goal is to further empower “the Zionists,” the significance of that message cannot be overstated.